According to a recent report by Transparency Market Research (TMR), the lithium-ion battery market is presumed to develop significantly in coming years. Companies like Samsung SDI Co., LG Chem Power INC., and Panasonic Corporation are leading the global market holding 57% of the 2016 overall share in the market. Many companies are emphasizing on developing products that includes updated electronic advancements and provides higher battery performance. Players are looking forward to additionally invest in a way so as to gain strategic advantage over their competitors. 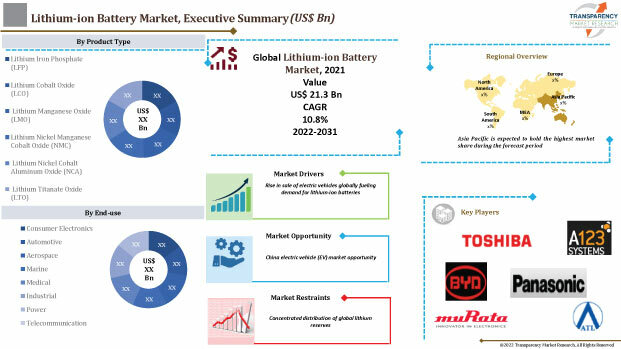 The global lithium battery market includes key vendors like Hitachi Chemical Company, Toshiba Corporation, GA Yuasa Corporation, Ltd., Panasonic Corporation, Automotive Energy Supply Corporation (ASEC), and Johnson Controls Inc. In order to advance in the stiff competition in the market, these vendors are further investing in strategies like joint ventures and collaborations as well as mergers and acquisitions. An agreement was signed between LG Chem Ltd., and Daimler AG for the supply of higher quality lithium-ion batteries and installing those batteries in their smart vehicles. This innovation is likely to strengthen the distribution of automotive battery provider and enhance its network presence. TMR report analysis states the global lithium-ion market forecast to reach a valuation of US$77.42 bn by 2024 from US$29.68 bn of 2015. The market is projected to grow at an 11.6 % CAGR for the forecast period 2016-2024. Consumer electronics is presumed to contribute half of the overall global revenue during the forecast time span. It is emerging as the leading key segment application with swift pace and traction gain. Geographically, Asia Pacific is forecasted to grow swiftly with the booming consumer electronics industry and its instantaneous adoption of lithium-ion batteries in the market. Environment change concerns have brought about an urgent need for renewable energy resource adoption apart from reduced battery costs, diminishing solar photovoltaic costs and positive government motivation. With the introduction of electric batteries, fuel have been substituted hence giving hybrid and electric vehicles an opportunity to develop further. Besides, the strict policies of the government implied on exhaust standards specifically provides goal to reduce polluting factors and protect the environment. These factors are likely to contribute in fueling the growth of the global lithium-ion market in the years to come. While Lithium-ion batteries hold equal importance for both government funding agencies and industries, the ability of these batteries to store portable energy in the long run is uncertain. Although Lithium batteries are expensive at present but the shortage of some transition metals present in these batteries may eventually become an issue. The electric vehicle market of China is also expected to witness a significant friction in the coming years. As compared to conventional lead acid batteries, the high cost of Lithium-ion batteries and lack of awareness with regard to its benefits may pose a threat to its growth in global market. However, the rising shift in the automotive sector towards sustainable clean fuels as well as the rapid growth of the consumer electronics industry are anticipated to pilot the lithium-ion industry in years to come. There is an anticipated decline in prices of small gadgets giving rise to spread of growing disposable incomes all over the world. This is further predicted to add fuel to the global lithium-ion market.